Part original, part documentary and part reconstruction, the emotional story of the ill-fated film project L'Enfer, an enigmatic and original film about a hotel manager who becomes possessed by the demons of jealousy. This documentary about one of the greatest movies never made is something I can't recommend enough - just for the experimental photography alone it's worth the price of admission. Flicker Alley recently released it on Blu-ray. with the exception of clouzot's footage, which i agree is worth watching the film for, i thought this was pretty dull. it's an extended making of, a really sterile portrait of clouzot that really does nothing to expound on the man passed what anyone familiar with him might already know. Kind of agree with both of you. I was always transfixed and sometimes bored. A quality in movies I appreciate is when the form of the movie is meant to evoke a feeling from the movie, and at the end of this one I felt like the filmmaker had navigated my emotions into a dark circle. Which is where Clouzot was during the shoot. The test footage was stunning, but the production information and footage was also mesmerizing in a different way. What was Clouzot looking for? Here is this guy, this meticulous planner of movies, who has, for Inferno as well as for other movies, storyboarded, done test shots, etc, he's the French Hitchcock after all, and he begins to shoot Inferno and he becomes as if another man. The movie's planned, he just could shoot the movie, but he can't move the film forward, and it doesn't seem like a creative block, and the crew's there. This is a mystery greater than any mystery from any of his films I think, and I love love Clouzot's movies. So I think it was wise of the filmmaker to make it mostly about this shoot. The usual 'career trajectory' narrative is never interesting. For example the recent Cameraman: The Life and Work of Jack Cardiff. Love Cardiff too, but Cameraman is something I'd expect to sit down in a museum and see. 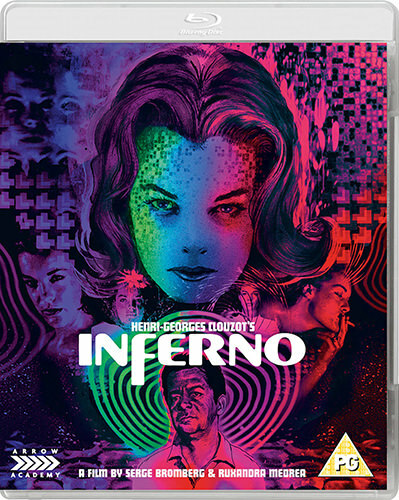 Henri-Georges Clouzot's Inferno is for the theater.